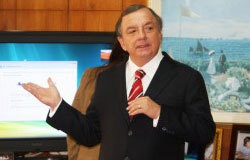 Successful businessman Alvaro Noboa gave a new year’s speech in his office on Wednesday. He spoke to the main board of his companies and congratulated them for their efforts on 2010. He also talked about his plans for 2011 and announced that his two sons, Daniel and John Sebastian, wil be working at his companies.